The City of Fremantle and the Town of East Fremantle have joined forces to help boost local recycling rates. 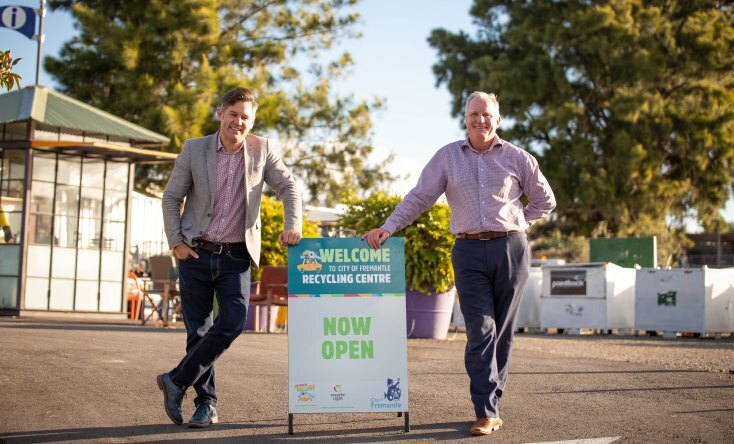 In a new partnership between the two councils, the residents of East Fremantle can now access the City of Fremantle’s revamped recycling centre. The centre, on Montreal Street, was upgraded last year to double its size, improve its layout and expand the range of materials it could receive. Residents can come to the centre to dispose of a wide array of recyclable material, including cardboard, polystyrene, white goods, scrap metal and e-waste. Fremantle Mayor Brad Pettitt said it was terrific that East Fremantle residents could now take advantage of the service. “It’s proven really popular with Freo residents so it’s really exciting now that our neighbour East Freo will be part of it and be able to use it as well,” Mayor Pettitt said. “What’s really important about the centre is that the recycling rates are much better than just simply putting stuff out on your verge and waiting for the truck to come and pick it up and take it to landfill. East Fremantle Mayor Jim O’Neill was given a personal tour of the recycling centre and said he was very impressed. “It’s fantastic – absolutely great,” Mayor O’Neill said. “I have to say thanks to the City of Fremantle – Brad and the staff - for allowing East Fremantle to join the partnership at the recycling centre. “To allow our residents to come here and get rid of those hard items – paint, batteries, the stuff no-one really knows what to do with – and to deal with it in an environmentally positive manner, that’s something the Town just had to join. As well as being able to drop off recycling, East Fremantle residents will also be entitled to four drop-offs of household bulk waste per year. A letter with information about the new services along with a brochure advising what can and can't be recycled will be mailed out to East Fremantle households shortly. Residents are advised to keep hold of the letter, bring it along with them when dropping off household bulk waste and have it stamped by centre staff. Music in this video by Bensound. For more information visit the Recycling Centre page on the City of Fremantle’s website.